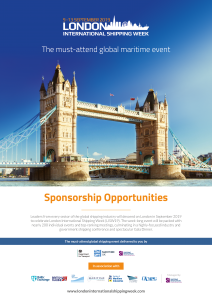 Sponsorship of LISW19 will propel your company to the forefront of the world’s shipping industry and, depending on the level of sponsorship you choose, affords the sponsoring company unique access to government and industry leaders. A variety of tailored sponsorship packages are available. All of them associate the sponsor with the entire week while some offer additional, focused exposure during the LISW19 Conference, Gala Reception and Gala Dinner. Subject to space and availability, the sponsor’s logo will appear on all official marketing material, including websites and advertising, the official ‘App’ and social media, as well as on the pop-up banners that will be displayed at each LISW19-endorsed event. The bigger the sponsorship, the more prominent the sponsor’s logo and branding will be. The top-level sponsorship packages guarantee complimentary conference and/or dinner spaces. They also offer complimentary advertising in the Official LISW19 Event Guide, which will be distributed at ALL events throughout the week and included in the delegate packs at the LISW19 Conference. As an LISW19 sponsor you will be entitled to hold your own official event during the week. This may be private or public, free of charge or paid-for. It will appear in the official listings, website and App and, where appropriate, will receive substantial promotional support. We will be pleased to discuss your options and any ideas you may have to promote your products or services. An exclusive opportunity to sponsor the market opening of the London Stock Exchange on the first day of LISW19. A once in a lifetime chance to push the button to start the day’s trading and to officially launch the start of LISW19. This key sponsorship includes a Champagne Reception and Breakfast. Attendees will include dignitaries, invited guests, LISW Board of Advisors and Steering Group members, UK and foreign Government Ministers; key speakers and of course the Press. As Sponsor, you will also have the opportunity to invite 10 clients. You will have prominent branding, both online, and offline, and you will be entitled to host an event during LISW19. • The sponsor of the official LISW19 Conference bags provided to all delegates, speakers, sponsors, press and VIP attendees. The App is an interactive experience that connects delegates, speakers and sponsors. • The sponsor of the Conference Notepads & Pens provided to all delegates, speakers, sponsors, press and VIP attendees.